﻿With fall decorating coming to an end, I thought I would take out my leaf cookie cutters and decorate some sugar cookies. 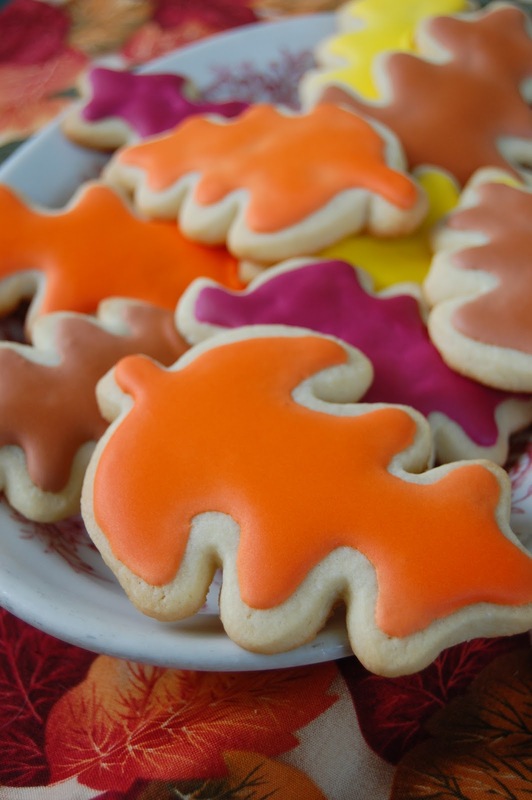 Unfortunately, I decided to try a new sugar cookie recipe, and although the leaf cookies are pretty to look at, they taste horrible! Next month, I am participating in a cookie exchange, so I am so glad that I discovered this now and not in several weeks. Otherwise, I would have had quite a baking disaster. Have you ever had one of those? Awwww....they are so very very pretty. They would look LOVELY hanging on my Thanksgiving tree. And they looks so pretty - - and yummy! Thanks for the book suggestion, I'm always on the lookout for a good baking book. Spray those suckers down with acrylic sealant and tell people you MEANT to make ornaments. Does forgetting to add sugar to the pumpkin pies Thanksgiving Day measure up to this? Because I definitely did that and had to start over! I LOVE the new blog header!!! What program did you use? and how did you know how wide to make it... such silly questions. I want to change my web layout but haven't attempted it because... I'm afraid I might not be able to retrieve it if I change it and don't like it. Will have a techie person here for Thanksgiving - perhaps he will give me some tips? Thank goodness you know now. I know I would have figured it out about 3 seconds before the exchange! LOL! They do look beautiful though. I'll have to check out this book. I always have these dreams of baking and decorating pretty cookies like these. :) Your book suggestion make just make it reality! Thank you for the lovely comment you left. I just love how these cookies came out, they look perfect. I have the same cookie book but always forget to use it when baking. You have inspired me to use it.